A Go-NO-GO test using pin gauges to evaluate the jaw size which will be certified against the manufacturer’s specification. 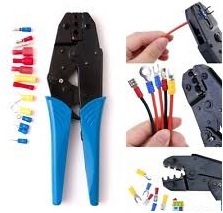 As many crimp tools are not manufactured to a specification, we will calibrate the crimps themselves. This method “The Pull Test” ensures that the crimped connections comply with the current British and European Standard (BS EN 60352-2) whether the tools are manufactured to a specification or not.